Clicking on any of these modules will open a control panel where you can set the status, position, title, access level (Guest, Public, Registered, Special), the position of the module within your website and more. For a better overview and navigation through the items, the component comes with a Category module, besides the available category view under the menu module. When subcategories are present, then the front-page visitor has to click on the plus sign in order to expand the tree and make those subcategories visible. In order to collapse the tree, he can simply click on the minus sign. If no subcategories are present, then only the simple structure lines will be visible. Clicking on one of the categories will redirect the user to a listing of those correspondent items. 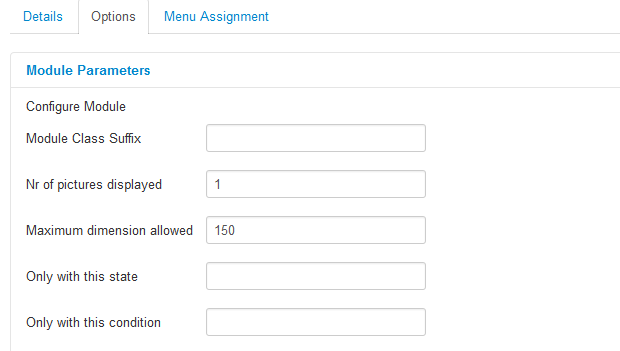 On the backend, you have the Enable Category Counter option which will display the number of items for each individual category. This module comes with diverse filtering criteria, being an all-in-one module. Since with it, you can display various listings, you can publish it in multiple instances in order to allow separate filtering. For example, if the Quantity filter will be set on "Only missing", then the module will actually become a "missing items module". Depending on the configuration, on the frontend, users will be able to click on the images of the items and be redirected to their details page. On backend, first of all, you can set the number of items displayed within the module with the Items displayed option, this will basically set it's size as well. Choose the Order on which the items will be displayed, either by Cart price, Quantity or Random, and also the Order direction to either Ascending or Descending. A condition can also be set from here in case you wish to display only the items that contain images and to add a maximum dimension allowed for them. In case the size is greater than the set value, it will resize the image. Enabling Display item's name will add the name of the items under their own images. Further conditions can be set through the Quantity: only missing, only in stock, or both criteria. 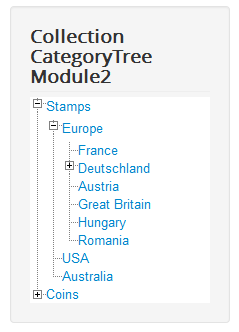 The last available criteria, making the module complete are the filters after a certain State or certain Condition. 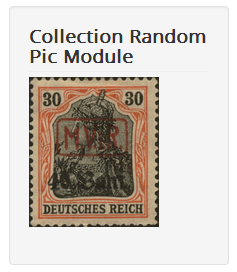 This module will simply display random images of the existing items from the database. The image can be clicked to redirect the user to the item's details page. 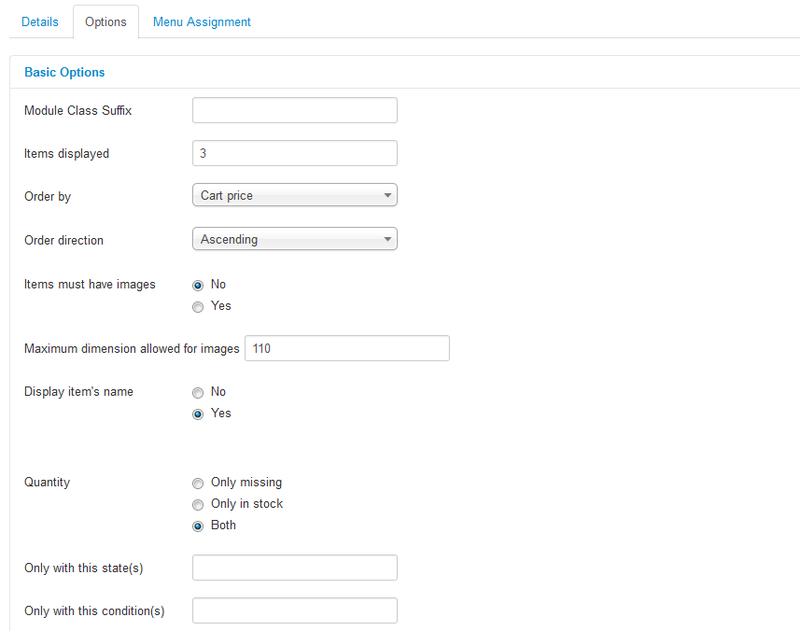 From the backend, you can use the Nr of pictures displayed option to set how many images will be displayed on the module and also set a resize value for them afterward. The displayed random items can also be filtered after a certain state or condition, if needed. Insert them into the fields, separated by commas. The search module of the component enables the search after a certain keyword through all existing item name fields. With the Check also description checkbox selected, the search filter will not only search for the keywords in titles but in the description fields as well. The search results will be displayed on the main page of the website and not on the actual module. Filling on the Price range fields, performing the search will consider as price here only the Cart price value. To perform a new search using different filtering criteria or simply without any filtering, click on the Reset button.